Sometimes I can be pretty bad at keeping track of the last time I posted a recipe. I'll think "oh, it was just a few days ago" or "it must have been last weekend, I can wait a little longer." Usually 'last weekend' seems to be two weeks ago and I guess I still have yet to grasp what a Gregorian day is. Ignore me, I'm probably just making excuses for pure laziness. For example, I'm watching Felicity for the first time on Netflix and the messiness of my hair is starting to rival hers. Actually, dismiss that earlier announcement of laziness and let me plead insanity for losing track of the days. I have the madwoman hair to prove it. Before I get to the food, I need to talk about this mug. Yes, the children on it are slightly creepy in their frozen exuberant states. No, I didn't buy these. 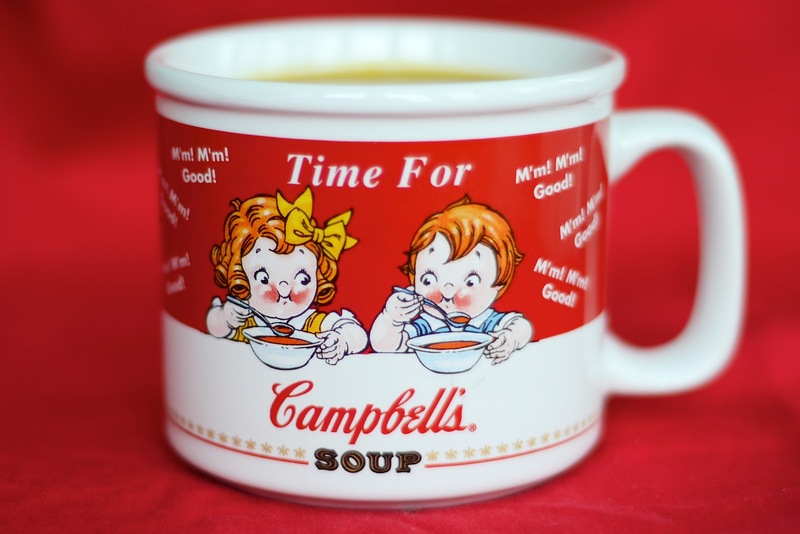 Yes, this pair of soup mugs is one of my more cherished hand-me-downs from my childhood. I can't remember exactly when they slipped from the shelves of my parents house into my kitchen, but I'm going to assume it was sometime during college. I remember growing up and eating tomato soup from these mugs on snow days as a kid. When I wanted a particularly large cup of cocoa, I would reach for these and hope my mom wouldn't notice. The love scratched spoon lines prove that they've been used for decades and probably will be for many more. Moral of the story, these mugs just make things taste better. 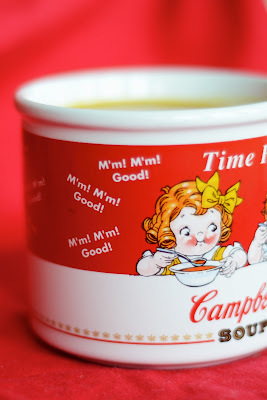 As these kids are showing you, dear readers, this soup is M'm! M'm! Good! Really good. As in sometimes I would sneak a chilled spoonful or two out of the tupperware just to make sure it still tasted awesome. The best part is I made the soup with surplus ingredients from the Super Bowl and some of my pantry staples. Roasting the carrots and peppers really brings out their sweetness while adding a nice depth of flavor. You'd also be a fool not to throw in some coconut milk too, trust me. When I first served myself a bowl, I realized I had run out of coconut milk. The soup was good, thick and hearty, but it lacked the creaminess factor I was lusting after. I later stirred in a can of light coconut milk and let me tell you, the difference was remarkable. 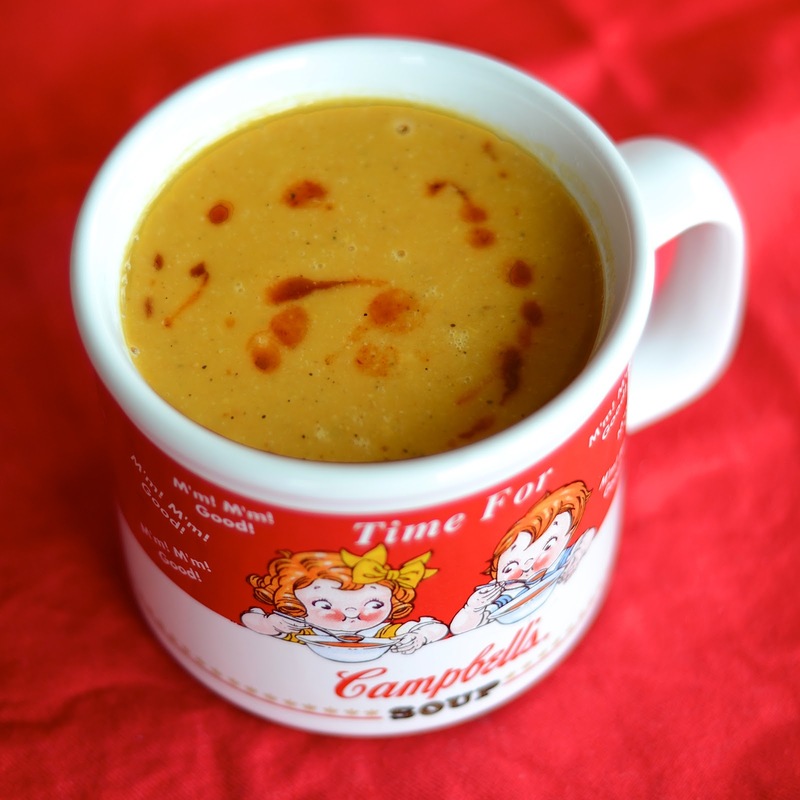 It also doesn't hurt that it added almost another full serving of soup! Preheat oven to 425°F and line a roasting tray with baking paper. Peel and chop carrots into 1 inch chunks, cut bell peppers into 1 inch squares and place them in the tray. Drizzle over about 2 tablespoons of olive oil, sea salt and freshly cracked black pepper and toss to coat. Bake for about 45 minutes until carrots & peppers are golden and tender. Remove from oven and set aside. Next, add lentils, curry powder, ginger, and chili powder. Stir and let cook until spices become fragrant, 1-2 minutes. Stir in veggie broth and bring to a boil then reduce to a simmer, cooking until lentils are soft, 10-15 minutes. 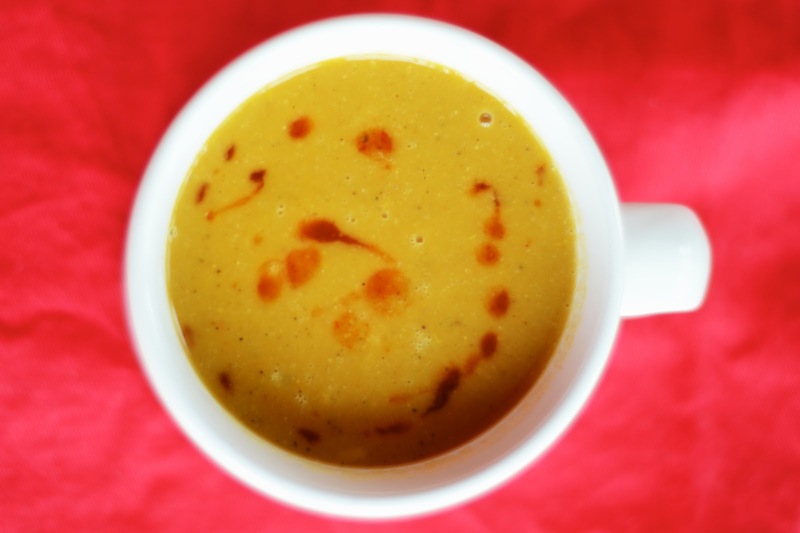 Remove from heat and using either an immersion blender or a regular blender, puree until soup is smooth. Return soup back to stove, stir in coconut milk, and heat soup for another two minutes, tasting and adding spices as you like. Loved it Kmart!! Thanks for posting such a delicious treat!